What's New in v 4.0? What's New in v 3.1? 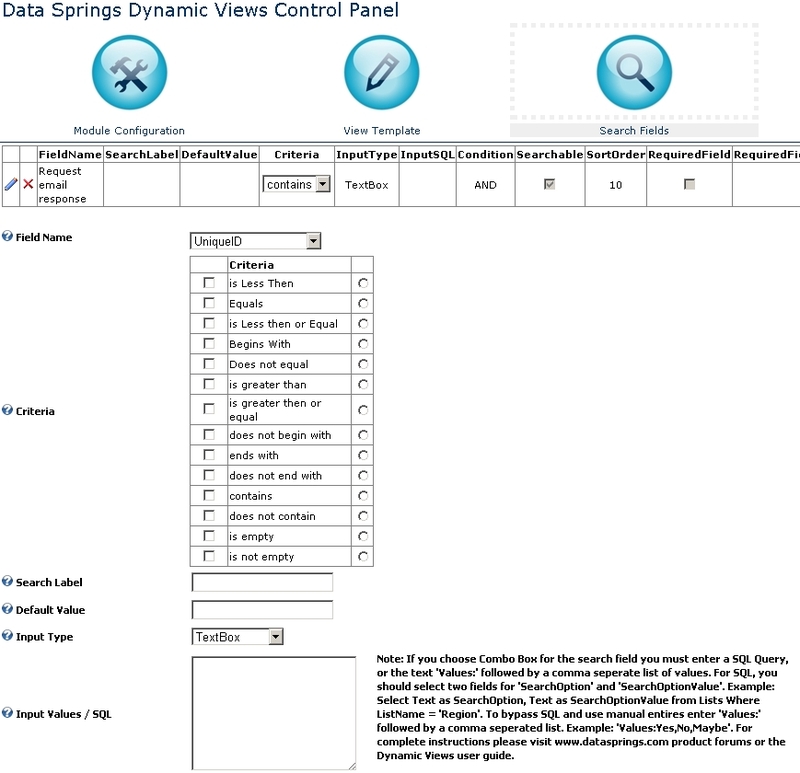 Now allows for multiple Dynamic Views instances on the same page! What's New in v 3.0? Conveniently get scheduled reports in your inbox! Simply set your specific criteria and have the reports automatically sent it as a daily, weekly, or monthly email. Even send to multiple recipients with the cc or bcc options. 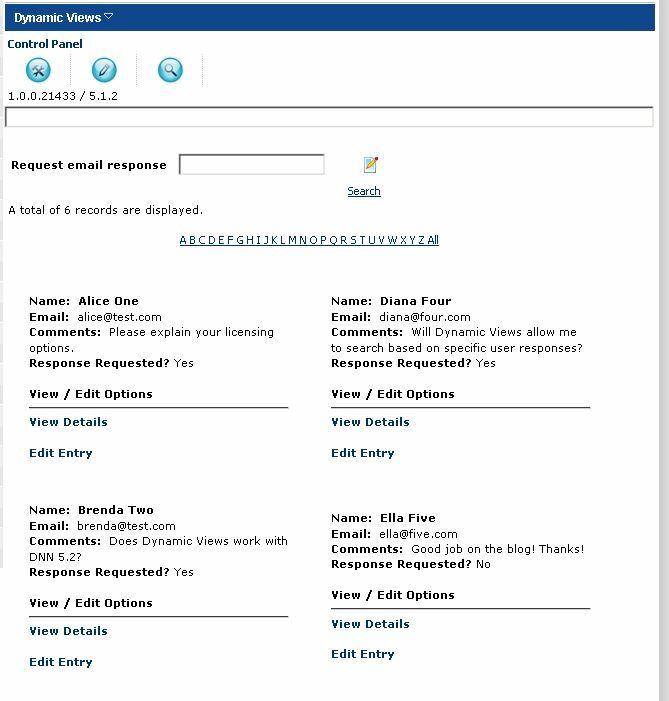 Receiving parties need not log in to manually run the reports through Dynamic Views. Performance boost at your fingertips -- adjust data caching intervals that work for you! Cleaner looks for custom integration -- Choose to hide all search functions, especially if search properties are passed from Dynamic forms or other modules. Don't need some module features? Choose to hide features that are not in use such as export to Excel & PDF and even the entire Admin control panel so they're out of your way! New Feature: You can now choose a data grid option instead of just the HTML Template options. This feature allows you to also select which columns you would like to display in the grid, define a unique CSS Class for each row and alternating row, etc. Get started much more quickly without having to create custom templates. Detail View Enhancements: Display each views detail record within a pop up via jQuery/AJAX modal pop up. 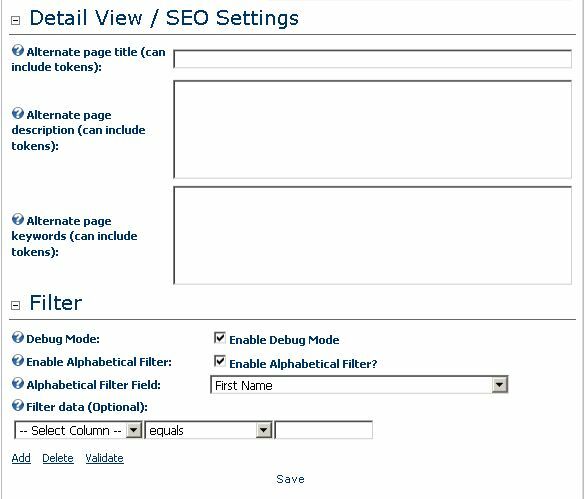 Search Enhancements: Optionally hide all search fields – This feature allows you to pass in the search items from other pages or utilize Dynamic Forms or other modules to create more robust search options. DNN6 Enhancements - New features take advantage of DNN 6 jQuery and CSS Classes. Templates for PDF exports are fully customizable! New Action section in Module Configuration allows you to create commands and functionality by building unique SQL actions against your records to manipulate the data. Your action token can be an image button or a link button. Want to add a "Delete This Record" button to your template? How about mark this record as "Paid" or add a role? This is where you set it up! Choose Hyperlinks or Linkbuttons to navigate through the Previous/Next paging. Using Hyperlink improves SEO. 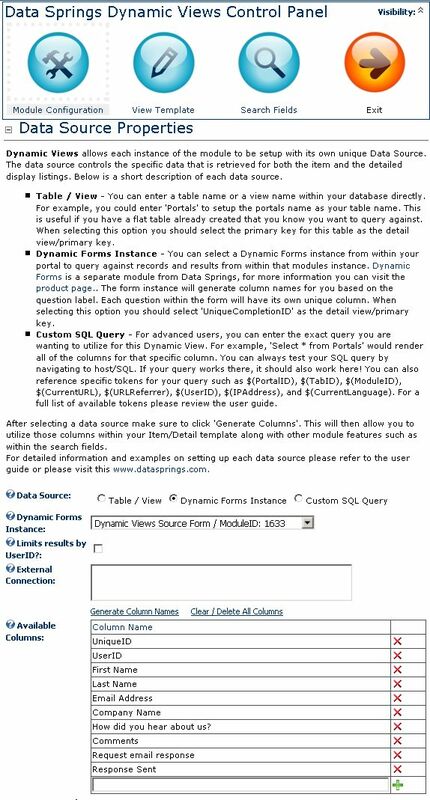 When choosing Custom SQL Query as the Data Source, you now have the option to use free form queries. That means your query can be in Oracle or MySQL, not necessarily in SQL Server. 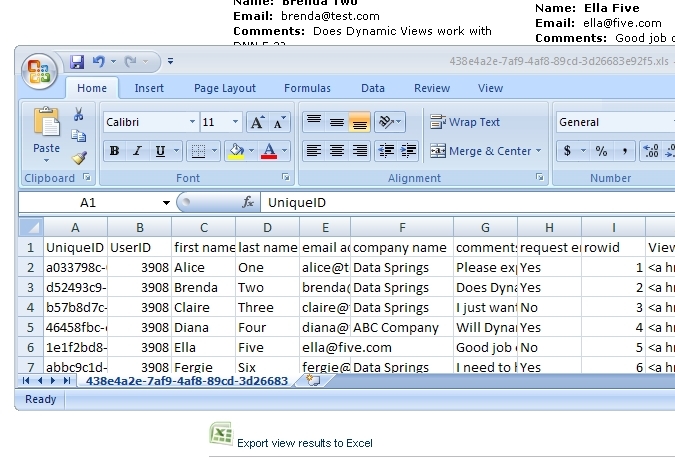 Dynamic Forms Integration: Allow for an 'Edit' token within the listing and detail template. This token will place the record in edit mode within Dynamic Forms - Now your entire workflow can be handled seamlessly. Optionally enable export to Excel and choose which security roles are allowed to export the results. Optionally modify search options such as button type (link/image), button location, and other search specific features. Optionally allow users to control the page size. 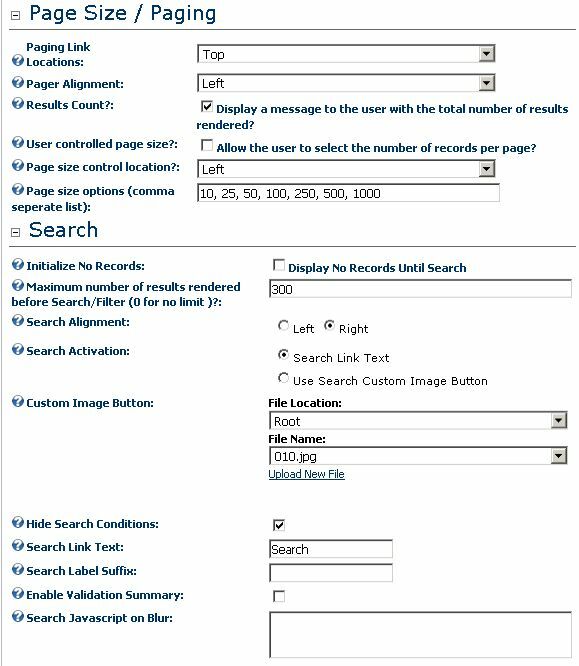 The administrator can specify the page size location dropdownlist and also the page size available options. Q. Can I use the module(s) on several pages on my site? A. Yes, you can have multiple instances of the modules across your site. Q. What if I have several portals on the same DNN installation? A. If you only have one DNN installation, your Standard edition will work for you across multiple portals. Q. What license will I need if I have several sites? A. The Enterprise Edition is a license for as many DNN installations that you directly own and operate. This, however, does not include a license to redistribute to clients. You may purchase Standard or Enterprise licenses on behalf of your clients so they have their own licenses. However, if you wish to purchase 1 license that will allow you to install at unlimited # of client sites, then you will need the Developer License. Q. 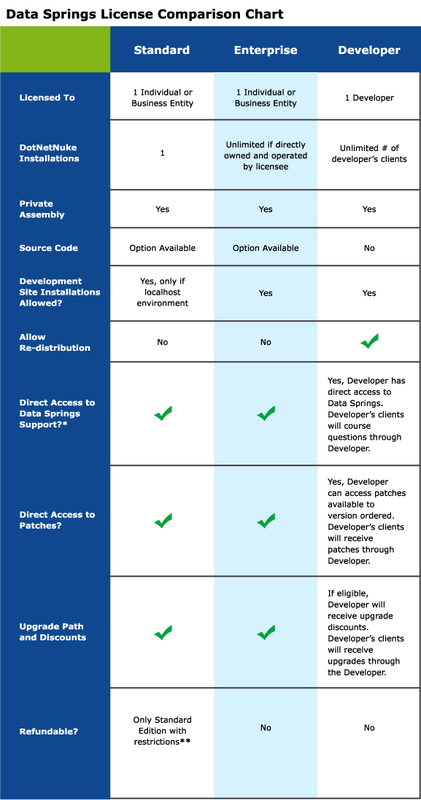 What kinds of customers will need the Developer License? A web developer who will install the module(s) in multiple client sites. A franchise company who operates applications using our modules across multiple franchisee websites. A business entity with independent contractors where the business entity provides website templates using our modules for various sites to operate the independent contractor's business. Q. What do you mean by “direct access to Data Springs support.“ A. For customers who have the Standard or Enterprise license, this means that the customer can contact Data Springs directly via the Contact Us (Support) Form or a Snowcovered HelpDesk ticket for questions and for problem resolution. The same is true if you have the Developer License. However, If you obtained your modules through a developer using a Developer License, please course all questions through this developer. The developer can contact Data Springs for issues that need further assistance. Please see our Data Springs Support Agreement for more details. Q. Please explain your policy regarding access to patches. A. All Standard, Enterprise, or Developer licensees can access patches within your Snowcovered.com account under Patches and Hotfixes and/or MyDownloads. However, if you obtained your module through a developer, please contact your developer directly to access any available patches. Q. What about the Upgrade Path and Discounts? A. As a Standard, Enterprise, or Developer licensee, there may be automatic discounts available to you when you upgrade. Please see our Upgrade Policy for details. If you obtained your modules through a developer, please contact your developer for product updates and pricing. 1. This is an agreement between Licensor (Data Springs Inc.) and Licensee, who is being licensed to use the named Software (“Dynamic Views”). 3. This License permits Licensee to install the Software on one installation of DotNetNuke® without additional fees or licenses. Licensee will not make copies of the Software or allow copies of the Software to be made by others, unless authorized by this License Agreement. Licensee may make copies of the Software for backup purposes only Note: If module software source code was purchased the changes made to the source code/recompiled version are still licensed only to one installation of DotNetNuke®. 5. In case of a breach of the Limited Warranty, Licensee’s exclusive remedy is as follows: Licensee will return all copies of the Software to Licensor, at Licensee’s cost, along with proof of purchase. (Licensee can obtain a step-by-step explanation of this procedure, including a return authorization code, by contacting Licensor at [[email protected]].) At Licensor’s option, Licensor will either send Licensee a replacement copy of the Software, at Licensor’s expense, or issue a full refund.